the toxic amino acid in Leucaena leucocephala, Mimosa spp. 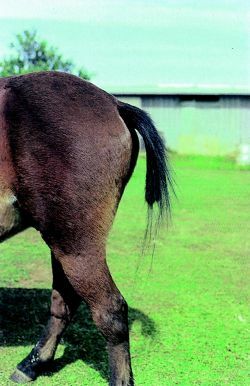 Causes depilation, especially of the long hairs of the mane and tail. The reduction of mimosine and tannin contents in leaves of Leucaena leucocephala, Asian J.
Perry Ch, Sastry R, Nasrallah I, Stover P Mimosine attenuates serine hydroxymethyltransferase transcription by chelating zinc. Prophylactic measures are the destruction of mimosine by heat (above 70[degrees]C), the use of chemical additives such as ferrous sulfate, ruminal colonization with the bacteria Synergistis jonesii, or utilization of leucaena in smaller proportion (<40%) for the animal diet (FRANZOLIN-NETO & VELLOSO, 1987). Leucaena contains tannins and the amino acid mimosine that could reduce the value of leucaena as a forage crop. Mimosine is a toxic compound presents in the tropical legume Leucaena leucocephala which restrict the nutritional use of this plant in domestic animals. The toxic product, called 3-hydroxy-4(1H) pyridone (DHP), comes from the toxic amino acid mimosine. 1989) reported that around 90% of mimosine is destroyed after 14 to 21 days of ensiling. 1984) reported that the concentration of 5% mimosine in broilers' diet decreased intake and affected the performance of the fowls, even though the effects of mimosine on the animals' performance are still unclear. Improved performance of LLM in fish production after soaking of the seeds in water for 2 days has also been reported [21, 22] to be useful for removing of up to 90% of mimosine (antinutitional factor) present in the seeds. Effect of mimosine on portal-drained visceral net flux and concentrations of amino acids and minerals in plasma of Alpine goats. The lower feed and nutrients intake as well as apparent digestibility values recorded for rabbits fed LLM treatments can be attributed to the possible effect of the anti-nutritional compounds such as mimosine and tannins present in L.